Rolly Waters is a recovering rock musician and part-time private eye. One night his band performs at a blowout party for EyeBitz.com, a fast-rising Internet startup that has the city of San Diego talking. When Rolly returns after hours to retrieve his guitar from the host’s mansion, he finds a dead body floating in the swimming pool. His discovery sets in motion a series of intrigues that drag him into the surreal world of dot.com culture, as well as the dark heart of his own uneven past. 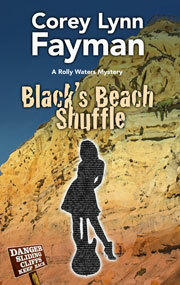 Black’s Beach Shuffle updates the classic Southern California gumshoe world of Raymond Chandler and Ross McDonald with contemporary technology riffs, new millennium anxieties and sun-blotted humor. It pumps out a page-turning mix of plot twists, colorful characters and laugh-out-loud humor as Rolly’s investigation ricochets him from the high-tech industrial parks of Torrey Pines Mesa to downtown blues clubs, from street taco shops to the penthouse of the La Jolla Hyatt, from the hallowed halls of academia to the sands of Black’s Beach, San Diego’s official clothing-optional playground.